I feel like I should have enjoyed this way more than I did. 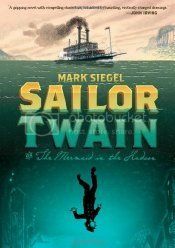 Part mystery, part fantasy, part myth, part horror, part love story, Sailor Twain is the tale of a riverboat captain, a reclusive author, and a nobleman, all whose paths eventually cross due to the discovery of a mermaid in the Hudson River. I'd like to say that I took something more away from the book, but really, that was it. The story didn't hold my attention like it should, and while the charcoal illustrations fit the mood of the setting well, I had a hard time with the fact that so many characters looked so stylistically different. Perhaps that was the whole point, but I didn't catch any meaning to it, other than to really make sure that each of the characters were distinguishable. There were some shining moments in the book, however: the way the captain's quarters transformed from the influence of the mermaid, for example, or the mermaid's realm. Thinking back on it, the only times I was ever really impressed with the book was with the visuals that dealt with the mermaid. While I'm a little ambivalent about this particular volume, I think I would pick up something by Mark Siegel again. Like I said, I feel that I should have enjoyed this way more than I did, so maybe it simply wasn't the right time for me to read this.